Life In A House of Blue ! : PearlParadise.com Giveaway ! Home > Giveaway, holiday09 > PearlParadise.com Giveaway ! 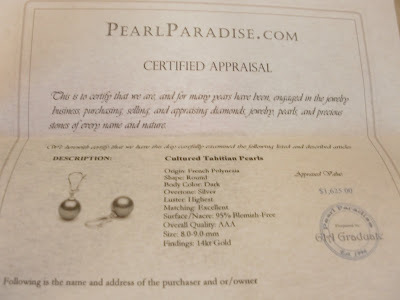 Recently I was given the opportunity to review a piece of pearl jewelery from PearlParadise.com, I was thrilled...who does not love pearls? I know I do ! 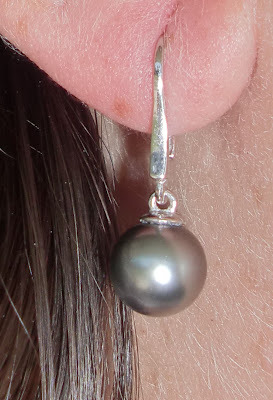 I chose the 8.0-9.mm AAA Tahitian Pearl Dangle Earrings . These earring are beautiful very classy yet has a modern look ! Details : They feature perfectly round, AAA-quality Tahitian pearls in silver overtone. The sturdy lever back style fits securely on the ears and creates an elegant look. They arrived in a nice box and also come with a pearl care kit and an appraisal. The pearl care kit includes a polishing cloth and care instructions. My earrings came with an appraisal valued at $1625.00. I chose the 8.0-9.mm AAA Tahitian Pearl Dangle Earrings that Pearl Paradise sells for the great price of $335.00 . WOW, that is a SAVINGS of $1290.00! PearlParadise.com carries something for everyone ! They have necklaces, bracelets, earrings, pendants, and sets available in Akoya, Tahitian, Fresh Water, White South Sea, and Golden South Sea pearls. Founded in 1996 and brought online in 2000, Pearl Paradise has grown into the world's largest online pearl company, with 2006 sales topping $20 million. With a custom-built, 1,400-cubic-foot vault filled with pearls, we offer a selection of pearls unlike any other pearl seller, online or off. Our commitment to offering prices 80 percent below retail has accelerated our growth. 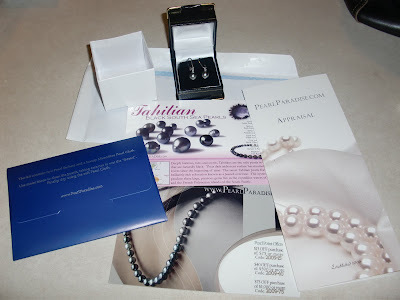 PearlParadise.com is giving one of my readers 8.0-9.0mm AAA Tahitian Pearl Dangle Earrings like I received!! I love the Full Set of 6.5-7.0 mm White Akoya Pearls! I love the 18-inch AA 7.2-10.0 mm Tahitian Round Pearl Necklace. These earrings are so pretty. Thank you so much for this giveaway. I love the pearl dangle earrings. Very elegant and simple. have you on my blogroll. I love the 7.0-8.0 mm Pink to Peach Cultured Freshwater Pearl Bracelet. I like this ring and how the pearl looks like it's being presented: http://www.pearlparadise.com/Orbit-Collection-Tahitian-Pearl--Diamond-Ring1829.aspx. I love the lavender freshadama pearl dangle earrings. I have never even heard of lavender pearls. Thanks for the great giveaway! I really like the double strand pink to peach freshwater necklace. Very nice. The Purity Collection South Sea Diamond and Pearl Pendants are beautiful--can't decide which color I like best though. Venus Collection Golden South Sea Baroque Necklace. I'D LOVE SIMPLE AND CLASSIC AKOYA STUDS. I want the 7.5-8.0 mm Lavender Freshadama Freshwater Pearl Necklace! The Pearl dangle earrings are pretty. Thanks for the chance. I like the Tahitian Baroque Tin Cup Pearl Bracelet. I LOVE the Akoya Pearl Bracelet it is amazing! I love the Tahitian Round Pearl Pendant. I love the 18-inch AA 8.0-10.8 mm Tahitian Round Pearl Necklace ! Those pearls are gorgeous! I have you on my blogroll at http://www.kidazy.com ! The 18-inch AA+ 8.0-9.0 mm Tahitian Round Pearl Necklace caught my eye. I like the Glacier Collection White South Sea Pearl & Diamond Pendant. I have been lusting after their 6.5-7.0 mm Pink to Peach Freshadama Freshwater Pearl Necklace for some time now and hope to get it someday. Thank you! I'm a purple girl, I like the lavender freshadama pearl dangle earrings. I think the Natural Black Pearl & Diamond Teardrop Earrings are gorgeous. I like the 7.00 mm black akoya pearl necklace. Thanks for the chance. I love the Orbit Collection Tahitian Pearl & Diamond Ring - it's absolutely gorgeous! The 8.0-9.0 mm White Freshadama Pearl and Diamond Ring is gorgeous! 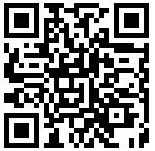 I have a link to your blog on my blogroll. I also like the lavender freshwater pearl bracelet. Love the round tahitian pearl charm bracelet, gorgeous!! I'm inlove with the Double Strand 8.0-9.0 mm White Freshwater Pearl Necklace. Very classic! I like the 6.5-7.0 mm White Akoya Pearl Bracelet. Thank you! I love that and it would be great to wear dressing up or with jeans. I really like the 8.0-10.5 mm Tahitian Drop Pearl Bracelet. As long as we're dreaming, I would love to have the 36.5" AA+/AAA 8.1-10.8mm Tahitian round pearl necklace. Beautiful! I love the Natural Abalone Pearl Diamond Ring. main entry: I like the 35-inch 6.0-7.0 mm White Freshwater Pearl Necklace as well. I Follow you on Twitter & Tweeted about this contest. I also love the 8.0-9.0 mm White Freshadama Pearl and Diamond Ring. I like the look of the 8.0-10.5 mm Tahitian Drop Pearl Bracelet. Love the color of the pearls. I follow on Twitter under April1p and tweeted. I love the Deco Collection Tahitian Pearl and Diamond Pendant! I like 8.0-10.5 Tahitian Drop Pearl Bracelet. the pearl dangle earrings are really nice! I sure like the 7.5-inch AA 8.5-11.0 mm Baroque Tahitian Pearl Bracelet. I just love the Natural Conch Pearl Diamond Ring...$3,300 WOW! I love the 6.0-6.5 mm AA+ Black Akoya Pearl Necklace. Found something that caught my eye! One of my favorites is the 8.0-10.5 Tahitian Drop Pearl Bracelet and the earring in this post, they are just gorgeous!! I love the 6.0-6.5 mm AA+ Black Akoya Pearl Necklace!